Yesterday, 200 family members, community members and lawyers across CA mobilized outside the headquarters of California Department of Corrections & Rehabilitation (CDCR) in Sacramento to demonstrate their support of the people on hunger strike at Pelican Bay, Corcoran and other prisons, and to call on the CDCR and Governor Brown to intervene in this urgent, life-death matter. Marching and chanting strong, a small delegation entered the CDCR lobby to deliver the over 7500 petitions and allow family members to ask questions about their striking loved ones. Oscar Hidalgo, CDCR Communications Director, came out after over 40 minutes of waiting and police threatening to arrest supporters for “trespassing” if they didn’t leave the lobby. No arrests were made. After a useless conversation with Mr. Hidalgo, the crowd decided to march to the state capitol building to confront Governor Brown’s office, continuing to chant and play drums. A smaller delegation of family members, someone who had been in the SHU, and another former prisoner, went into the Governor’s office and met with his corrections staff person Aaron Macguire and Director of External Affairs, Nick Velasquez. The delegation demanded more answers. Family members shared their intimate, painful stories of how their loved ones are being tortured, including a mother who had two sons in the Pelican Bay Security Housing Unit (SHU). The person who had served in the SHU 13 years ago vividly described how toilet paper and mail were used to terrorize him. According to Manuel La Fontaine, a former prisoner and organizer with All of Us or None and Prisoner Hunger Strike Solidarity, “The multi-racial, multi-generational, and multi-geographical representation of people power shown outside prison in solidarity with the hunger strikers reflects the solidarity happening inside the Security Housing Unit amongst prisoners across racial, generational, and geographic lines.” Members from the Yurok Nation closed the action in front of the capitol with a warrior song to honor the courageous hunger strikers in their 18 days without food. For news coverage of this action, click here (TV) and here (print) or visit the Prisoner Hunger Strike Solidarity “Press” page. Yesterday there were also demonstrations in Los Angeles, Las Vegas, New York and Philadelphia. While the mobilization in Sacramento was happening, more than 140 people across the continent joined a conference call for a direct update on the hunger strike, an overview of the demands, some info on the structure and purpose of Prisoner Hunger Strike Solidarity, and ways people can support the prisoners in winning their demands. Notes from the meeting will be posted tomorrow (Wed July 20th). A group of people in Haliburton, Ontario (Canada) gathered together to join the conference call and met with each other after the conference call was over. They then decided to form “Haliburton County Hunger Strike Support Committee” and decided upon action-steps for their solidarity work around this strike. This is a strong example of how people across the US and internationally can work together in using this blog as an informational and organizing resource to support their local work of resisting inequality, powerlessness and oppression, while also bringing global, wide-spread attention to this particular struggle and support the Pelican Bay Hunger Strikers in winning their demands. I am writing because it is a matter of life and death and I am afraid. I have been on a mediation team for the last couple of weeks on behalf of the prisoners in Pelican Bay State Prison and the talks have broken down. 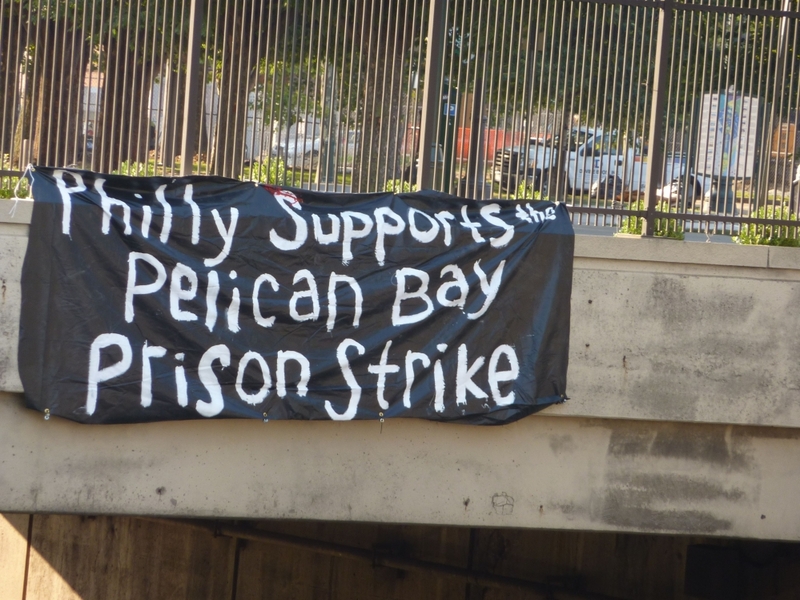 Prisoners in Pelican Bay have not eaten in 18 days. I have been told that the prison hospital is full with prisoners who are being hydrated intravenously because some have started to refuse water. Others are having a problem just keeping their water down at this point. Members of the prisoner negotiation team have lost between 20 and 35 pounds. It is truly a matter of luck and or untiring spirit that nobody has died so far. During the last conversation that I had with the prisoner negotiation team, they told me that nothing substantial was being offered. They felt disrespected but are staying committed to this course of action until CDC stops the torture. Some of them have been in solitary lockup for multiple decades with no possibly of getting out of the hole. They would rather die or continue to be tortured before they’d surrender their soul. Many of them have been committed to their terms of segregation because of alleged gang labels or prison associations. Many of them are there because someone said something about them in an effort to avoid a similar fate of torture. Many of them are there because they took the courageous stance to demand their humanity back and to organize with others to reclaim their human rights by demanding the CDC transform the conditions of confinement for the next generation. Many of them are there because they took the courageous stance to demand their humanity back and to organize with others to reclaim their human rights. The people who are leading this action in prison are surprisingly old. The prison officials demand that they betray fellow inmates by declaring their “gang activity” as a sign of their disassociation. Many of them have elected not to betray other prisoners or have simply not had any information to give prison officials. Just imagine if someone demanded that you surrender that core light in you. Some of you may not be able to denounce your sexual orientation, some of you may not be able to denounce your race, some of you may not be able to denounce your family or your god, and you certainly would not be able to betray people you know. Many of us have been told for years and years that Pelican Bay is where they house the worse of the worst, but I ask how much worse than you or I do you have to be to merit torture? Imagine yourself losing your color because of lack of sunlight, imagine the artificial light being left on in your bathroom-sized space 24 hours a day, making sleeping difficult. Imagine the insulation in your cell was there to stop the sound of human voices and your only human touch was during the course of a search or the process of handcuffing you. What makes these accumulated acts over the course of decades not acts of violence, not acts of torture? Many of us have been told for years and years that Pelican Bay is where they house the worse of the worst, but I ask how much worse than you or I do you have to be to merit torture? Imagine that you can’t imagine when you will be released. I was on Democracy Now a couple of days ago and when I looked at the video I could see how much this situation has weighed me down. I am only sending this email to people who know me, and I think you can see the worry and the sadness in my face in this video. I do not want people to die, but a handful of people can’t stop the state. This is one of the few times that I have seen prisoners in the state of California put their differences aside in order to stop the torture. Prisoners have had the audacity to try to change their conditions through peaceful means. I am afraid that the only one who can stop people from dying at this time is the governor. The only one who can stop people from dying at this time is the governor. If you are a minister, I am asking you to pray. I am asking you to ask other ministers to pray and possibly consider participating in an act of civil disobedience. If you are a person who knows the governor, I ask you to make contact on behalf of the mediation team. I don’t know that the prisoner negotiation team will not have disappeared or if they have not been disappeared already. If you are a civil rights leader, I am asking you to insert yourselves in this struggle of life and death. 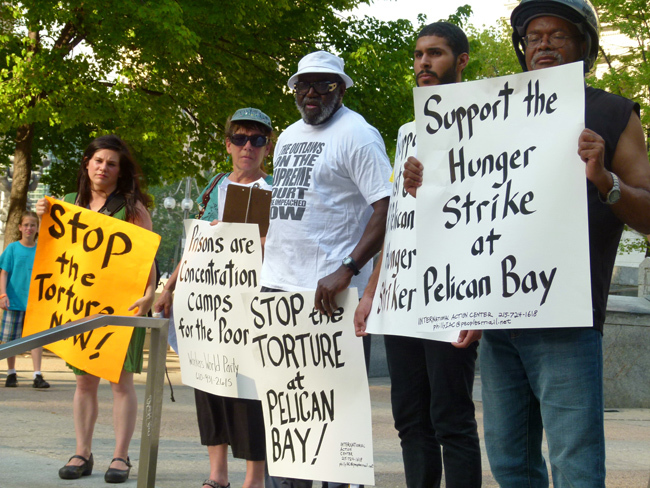 If they break the hunger strike, I ask you to engage in stopping the program of torture at Pelican Bay. If you are an activist, I hope you joined us in Sacramento on Monday. We need the governor to intervene because the prisoners no longer trust the courts or their guards to stop the torture. It is absolutely shameful that when we thought enemy combatants where being tortured in Guantanamo Bay, politicians flocked to Cuba. But politicians are ignoring the torture on our shores, in our front yard and in Pelican Bay. When we thought enemy combatants where being tortured in Guantanamo Bay, politicians flocked to Cuba. But politicians are ignoring the torture on our shores, in our front yard and in Pelican Bay. Where are our civil and human rights leaders at this most critical time? If we are not convinced that certain people deserve their humanity based on their past actions, does that strip us, world citizens, of our responsibility as humans? In other words, do the actions or perceived actions of others determine our inhumanity? My last request is that you pray for the team of mediators and their organizations, which includes me. We are not in prison, but we know that the state will come. Dorsey Nunn is co-founder of All of Us or None, executive director of Legal Services for Prisoners with Children and one of the mediators between the prisoners on hunger strike and the California Department of Corrections. He can be reached at dorsey@prisonerswithchildren.org.